(Pope, C.H. 1958. Snakes Alive and How They Live. Viking Press, New York, NY). Yesterday morning Lula (our dog) and I headed back from tracking our rattlesnakes on a trail through the mesquite forest. Lula was only a step or two ahead, so I couldn’t see the trail right in front of me. 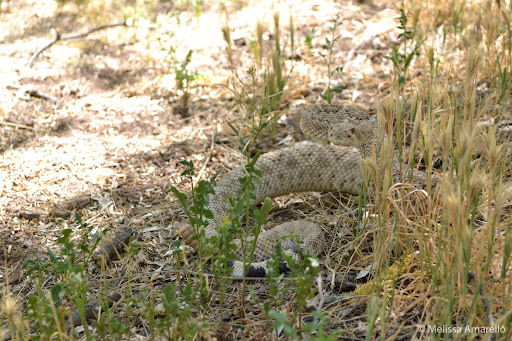 Mid-step, I saw a western diamond-backed rattlesnake (Crotalus atrox) stretched out across the trail where my foot was coming down. I immediately jumped back but Lula hadn’t missed a step as she walked right over the snake. The snake reacted to my jump by assuming the defensive posture seen above and rattling. So perhaps we have something to learn from the snake: it is in everyone’s interest to leave each other alone. Arizona Poison & Drug Information Center. Rattlesnakes (information on venomous snake bites in the USA). Gibbons, J.W. and M.E. Dorcas. 2002. Defensive behavior of cottonmouths toward humans. Copeia 2002: 195-198.